While browsing around Sephora I came across yet another palette that I just had to try. 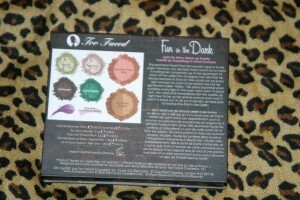 Too Faced Cosmetics brings us a Deluxe Palette named Fun in the Dark which comes with a light-up mirror, hence the name. I liked the idea of being able to do a quickie touch-up at a lounge without having to head to the often over crowded ladies room. So yes Too Faced, you reeled me in yet again! When I got home I tossed my purchases into my huge bag of Makeup to test at a later date, so when I finally got around to opening up the box I noticed that the light-up mirror didn’t work BOOOO! I was pretty bummed that the mirror didn’t work since this was one of the main reasons that I purchased the palette. 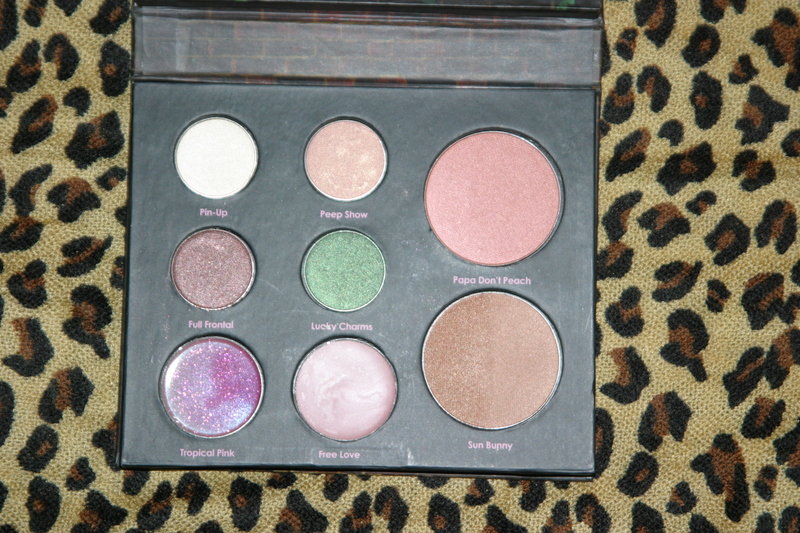 The kit contain four eyeshadows (Pin-Up, Peep Show, Full Frontal, Lucky Charms), a lip-gloss (Tropical Pink), a lipstick (Free Love), Blush (Papa Don’t Preach) and a two tone bronzer (Sun Bunny). The case has the usual Too Faced vintage images and a magnetic closure to keep the palette shut. The colors are pretty, nothing out of the ordinary in terms of shades but that can be a plus if you’re looking for everyday colors. 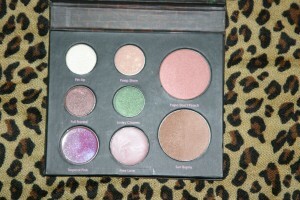 The palette is small so it’s something that you can toss in your bag that’s neat and small. The palette retails at $32.50 so it’s pretty easy on the wallet especially if you’re a beauty junkie like me and you buy makeup like you buy breakfast. My favorite piece of the palette is Sun Bunny bronzer, I like how it’s a mixture of a pink and gold shimmery tone which would compliment just about any complexion. My least favorite would be the Tropical Pink lip gloss which looks great in the palette but when applied it looks more like a clear gloss with flecks of glitter. The shadows apply smoothly and are highly pigmented which I like – they feel like velvet on the skin. Overall this is a great kit that is easily worth the price because all the items purchased individually would cost much more. If you decide to purchase this kit just be sure to open it up to make sure that the lights work before purchasing. 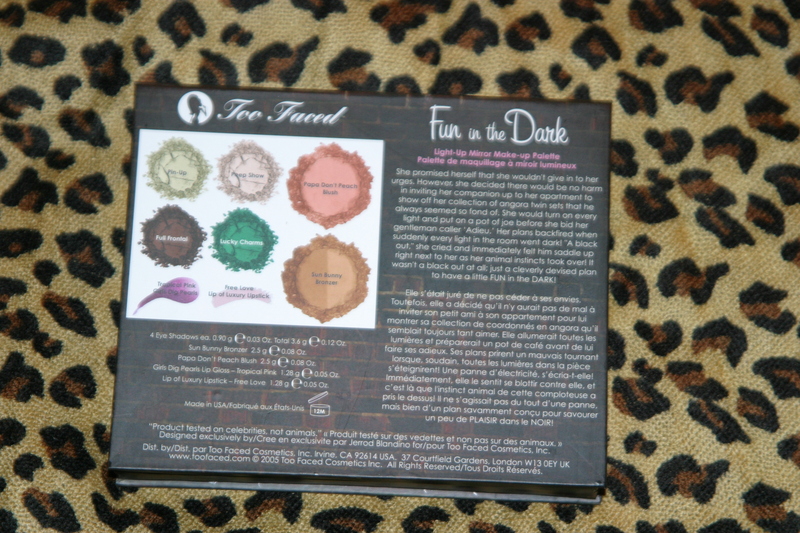 Go ahead ladies, get Too Faced!